Hi guys, I have a brand new video for you!!! This zoodle dish is truly so fast, so easy and so delicious! If you are vegan or trying to eat plant-based more often then this is your perfect dish. It’s nice and light and I have eaten this as a main course (raw and vegan!) or I like it as a side dish with roasted salmon. I know that my obsession with zucchini noodles is still alive and well, but one try and I am pretty sure you will be a convert too. 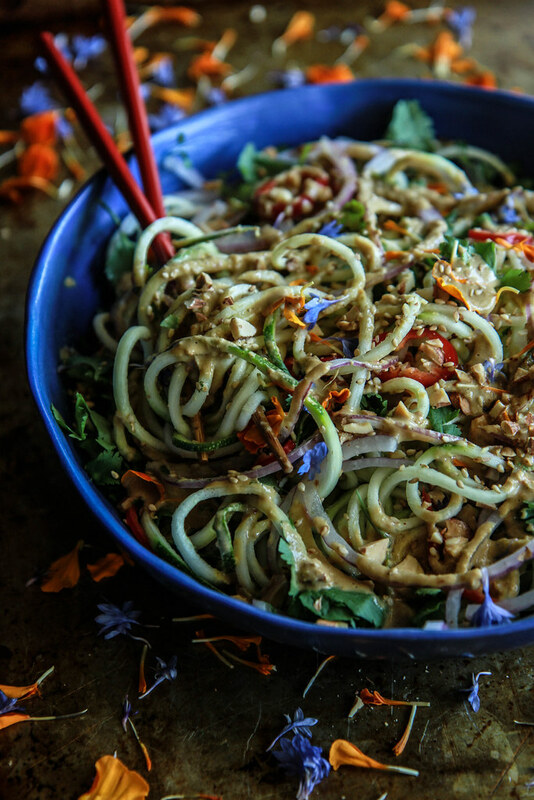 In the mean time, you could start here or here and try the raw zucchini noodles, they are seriously delicious and a truly healthy alternative to noodles and pasta! Run the three zucchini through a spiralizer. This is my favorite brand. (if you don’t have one, than you could grate the zucchini. Place it on a platter or in a bowl. Add the thinly sliced red onion and red chili. Set aside while you make the Thai Dressing. For the dressing, combine the red chili, garlic cloves, ginger, green onions, vinegar, soy, sun butter, sesame oil and coconut milk in the jar of a blender. Blend on high until you have a smooth dressing. Toss the zucchini noodles with just enough of the dressing to get it well dressed- (you will probably have leftover dressing). Once the noodles are well dressed, season to taste with kosher salt. Then add the almonds, sesame seeds and gently toss with the fresh cilantro. Serve immediately. haha, I felt the same way when I was in NY – there’s so much food!! Enjoy the rest of your trip!….and I’m going to enjoy this recipe soon! Definitely a keeper! I really love this! I always just do pesto or tomato sauce with zucchini noodles. I love putting an asian spin on it for something new and different. Great idea! Just made zucchini salad today, BUT Thai flavors will always win me over. Gorgeous Heather! So in love with this salad! Absolutely adore this especially the Thai flavors! I think I need to invest in a spiralizer! What a picture perfect salad! I’ve got to get one of those spiralizers!! Oh I love it whe. They let you sleep in itinerary that! My little cole is finally at that she too. 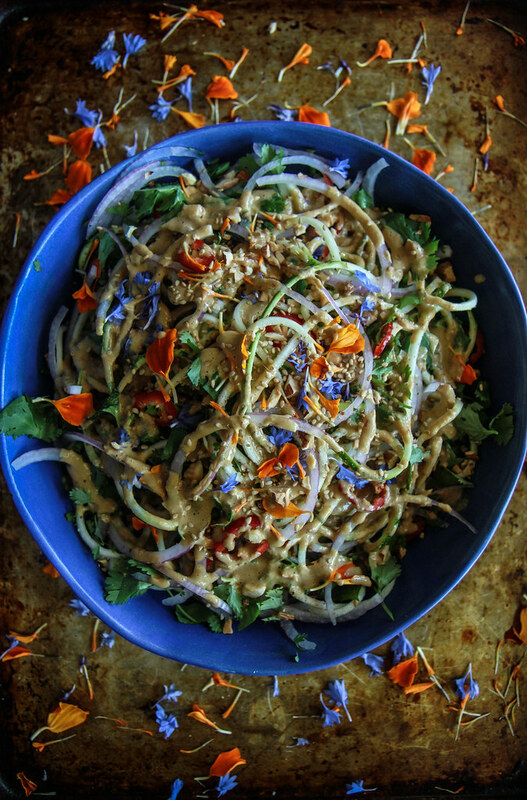 Love this Thai Noodle Salad. Can’t wait to try it. No peanuts for me, so I’ll have to make it with cashews. This is so gorgeous and fresh, just what I want for lunch! This is beyond brilliant – dying for these flavors! This is so beautiful and it looks so delicious! I need to get myself a spiralizer 🙂 Love visiting NYC! Hope you have fun! What a gorgeous salad! I love all of these flavors. 🙂 I’m glad you got some extra rest! NYC is certainly the place for walking! It sounds like you guys are having so much fun. I think this salad sounds like the perfect way to eat up a massive zucchini harvest — cool and spicy and delicious! Salads like this are what summer is made of. Love zucchini noodles! I would love to hear a round-up of your favorite spots in New York. This salad looks incredible too, I love all the crunch! Hi, I love this recipe! I have a blog about my healthy lifestyle change after it had a mini stroke at 28. Would you mind if I put this recipe and your picture on my blog and give you full credit? Hi! This looks delicious! May I ask how many calories, carbohydrates and fats it has in it? I’m not sure Wanda! Sorry- maybe plug the ingredients into one of those nutritional content formulators? Just made this for my supper, it was absolutely delicious. That dressing is beyond great, I’ll be using it again with other things as well. Cheers! Awesome Hatx!! So glad that you loved it! Yes Jo- they will weep water after sitting in the sauce which has salt. If you try that technique- will you let me know how it turns out? Just got back from a full on eating and drinking holiday in Italy! need I say more? Zucchini noodles are a summer staple in our house! Made this tonight and it was awesome. Sauce is sensational. Thank you Krystal- I am so happy you liked it! Hi. Thank you for the recipe. I can’t seem to find which spiralizer you like to use. Could be because I am looking at your recipe on my phone. Could you please post it one more time? Thank you! Hi, I like the inspiralizer best! Would this be good with slightly cooked Zoodles? Thank you so much Maja!I think that you will really love it! The idea to serve with roasted salmon sounds delicious!! that sauce looks SO yummy! 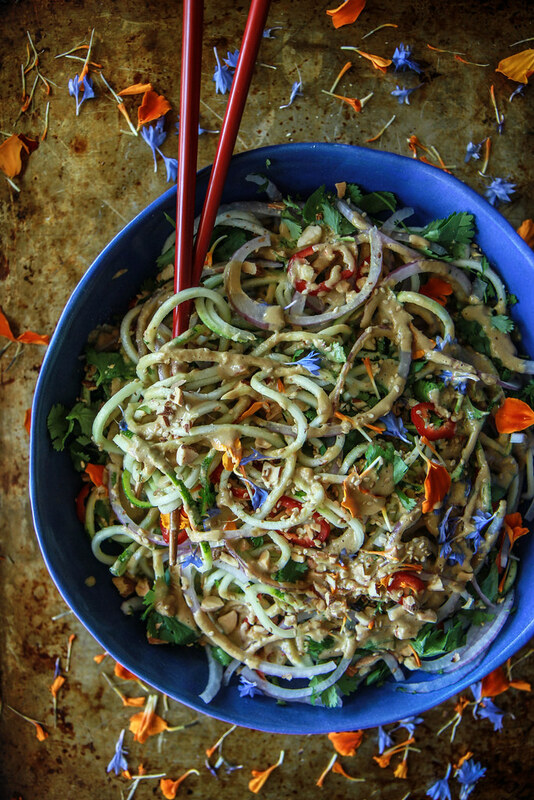 Love this spin on zucchini noodles! This Thai Dressing sounds so amazing! I have all of the ingredients for this and cannot wait to try it! Sounds delicious can’t wait to try thanks! I think you have accidentally listed peanut butter instead of sunflower butter. Thank you Narelle- I will fix that right away. I just found your blog today and I’m in love with every recipe, the pictures, your videos and your wonderful personality. I’m trying to eat more plant based food and they way you present the food is amazing. Thank you so much Carlos! I’m so glad your here and hope that I can help! Looks great! The link to the spiralizer you use isn’t functioning…..which one do you use? Mine doesn’t make them as well.